Hello from New Haven, Connecticut! 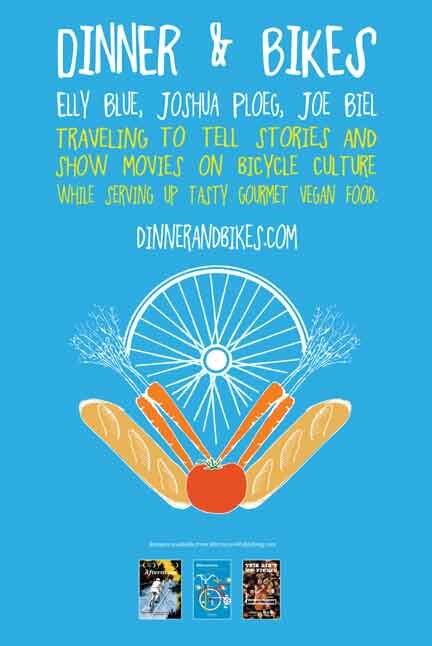 We’re slowly making our way through the Northeast and enjoying every minute of bikes, books and delicious vegan meals. After spending a splendid few days in New York, with events in Schenectady, Syracuse, Buffalo and Ithaca, we had dinner and discussed bikes in New Haven last night at City Hall. This morning, we were delighted to spend some time tabling in front of the Devil’s Gear Bike Shop for New Haven’s bike to work day. Our time through New York state went all too quickly, but we’re so very grateful to everyone who came out to chat, sponsored, housed and showed us around town. We’ve met so many wonderful folks along this tour genuinely interested and working card on building a better bike culture for everyone. We’re just barely halfway through the tour however, which means we’ve got lots more dates ahead of us. Be sure to check out the full list! New Haven, CT Alderman Douglas Hausladen and one of our event organizers Holly Parker with Joe and Elly. Comments Comments Off on Hello From New Haven!